Still waters reflect the truth of our heavenly and earthly selves. Today's post is a classic post from 2/6/12. This morning, after a long absence, I returned to my favorite park spot to greet the sun. What I found both surprised and comforted me. Everything was exactly as I left it three years ago when I gave up my sunrise trips in favor of sleep and blogging. The lone pine that bravely sticks its head above the canopy of deciduous trees—daring to be an individual, daring to claim the nourishment it needs—was still there. The constant din of traffic was there, still challenging the profound underlying silence of the park. 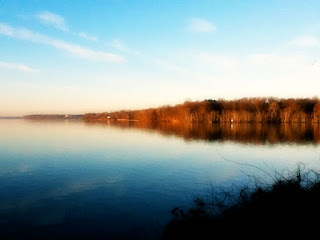 And the same glassy water was right where I left it, reflecting the beauty of the sky above. I confess I don't know enough about rivers to know why they always seem so still at the liminal times of the day. Maybe it has to do with the moon or tides. Maybe it's the weather. Maybe it has to do with passing boats. But it seems like the river's surface is calmer at dawn and dusk than it is in the middle of the day. It could just be this particular location. A few miles away at Great Falls, the river is never calm. We're kind of like the river in our spiritual journeys, aren't we? Sometimes we're calm and still, reflecting back both the beauty that beams down from above and that which gathers around us in our lives. And sometimes we're jumbled and chaotic, reflecting back a more distorted view of our reality. We move in and out of the pocket of love, flowing with the tides and the forecast. Looks like a pigeon, but it's a dove. The other day, a couple of miles upriver, someone came across two doves that had been decapitated in some sort of ritual. The article said that doves and pigeons are pretty much the same bird. "Dove" and "pigeon" are used interchangeably and not even experts agree whether there's a difference or not. But you know the difference, don't you? 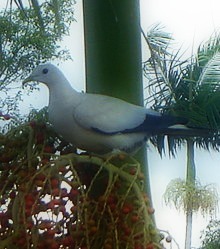 Doves are those pretty white birds that mate for life. And pigeons are those nasty gray ones that poop on everything. Right? Turns out pigeons and doves reflect something back on us, too. Looks like a dove, but it's a pigeon. Everywhere we look in life there's a mirror. Our friends and family reflect back our strengths and insecurities. Our words and actions reflect back our beliefs and attitudes. Even the things we don't do or say...the people we don't hang out with...reflect back on us. We may be able to successfully hide our truth from others, but no matter where we look or what we do, our truth is always looking back at us. That's both good news and bad. The bad news is that, wherever you see something you don't like, you're responsible for it being in your life. The good news is that you also have the power to change it. Even if you can't immediately change your circumstance, you can change the way you view or approach it. So this weekend, see how many mirrors you can spot in your life. What does your home say about you? Your choice of a mate? Your pets? Your job? Your response to the email you just got? The quality of your friendships? The condition of your shoes? If you see something you're not pleased with, why is it still in your life? Moreover, check the state of your internal waters. Are they calm enough to accurately reflect back some higher aspect within you? Or are they choppy, rough and discombobulated? If they're the former, don't take that connection for granted. And if it's the latter, consider what stills you and move toward that. Ultimately, the difference between living a pigeon life and a dove life is all in the way you see it.